The growl of traffic from Boston Post Road fades to a whisper among the oak and white pine of the Nobscot Scout Reservation in Sudbury. A narrow trail over soft earth presses up a steep hill, to Tippling Rock, an outcrop of ledge where the woods suddenly fall away to reveal a wide panorama. The Blue Hills are a mound in the distance, across waves of forest in autumn colors, and on the horizon the truncated tips of the Hancock Tower and the Prudential Tower peek above the trees. Tippling Rock has drawn hikers for more then a century. Ralph Waldo Emerson walked here for the view. 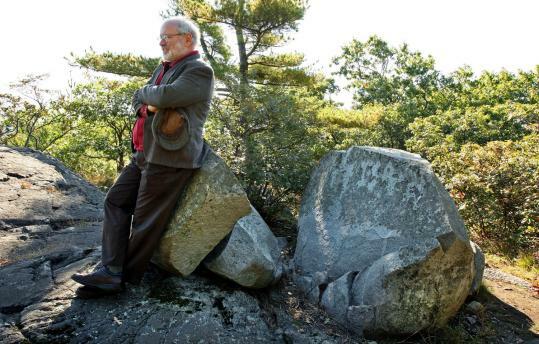 So did Henry David Thoreau, says Ron McAdow, executive director of Sudbury Valley Trustees, a land trust helping preserve Nobscot Reservation. Today the vista from Tippling Rock is a highlight on the Bay Circuit Trail, a 200-mile footpath around suburban Boston that was first imagined nearly 80 years ago. Most people have heard of the Appalachian Trail, and serious hikers are acquainted with the Long Trail in Vermont and the Pacific Crest. But after two decades of nudging, begging, and lobbying by trail advocates and volunteers, the lesser-known Bay Circuit Trail is nearly complete, providing people in Eastern Massachusetts an opportunity for long hikes, without a long drive. The Bay Circuit arcs around Boston, from Plum Island in Newburyport to the Bay Farm Conservation Area at the Kingston-Duxbury line. It's a Frankenstein trail, stitched mainly from existing footpaths over land owned by state agencies, municipalities, land trusts, utilities, and conservation groups, mostly inside the corridor between highways 128 and 495. Where forests no longer exist, the Bay Circuit follows town streets, sticking wherever possible to historic neighborhoods. What the trail needs now are people to walk it, says Alan French, head of the nonprofit Bay Circuit Alliance that has nurtured the trail's development for two decades. "Maybe it won't be in my lifetime, but the goal is to get people to know the Bay Circuit, and to use it. Because then they will protect it," he said. Proposed in 1929 as a "greenway" similar to the Frederick Law Olmsted parks around Boston, the Bay Circuit was designed to make connections. The trail links 50 Massachusetts cities and towns. It connects today's environmentalists with the land preservation movement of the early 20th century. And it connects residents of Greater Boston with nature. French, of Andover, is 76. In 20 years of work on the trail project, he has hiked the entire Bay Circuit four times, most recently last fall. On that trip, he stayed one night in a tiny park near the Neponset River in Walpole, a special spot where French and his wife, Mary, had slept in 1998 during a hike together. Seven years after the death of his wife at age 68, the Bay Circuit still connects French to her. "To spend 16 days on the trail with someone you love so much, with no telephones and interruptions, was very special and I'll never forget it," he said. Volunteers developing the trail don't expect many people to hike the whole thing; it's a difficult trip to plan because there are few places along the way to camp legally. The point of the project is to preserve undeveloped land, and to inspire people to get outside with the idea of long-distance hiking. "A trail that sweeps around the whole of Massachusetts Bay catches people's imaginations in a way local trails do not," says McAdow, who walked, biked and paddled the Bay Circuit with Al French in 1990, when the trail was still just a concept. "The idea that you could start at the North Shore as a pedestrian and walk to the South Shore, that's remarkable." After winding through communities northwest of Boston, the Bay Circuit passes Walden Pond near the site of Thoreau's cabin, and then continues into Lincoln. The trail snakes mostly south through the Castle Hill Conservation Area in Wayland, before passing Tippling Rock. It winds through Callahan State Park, works south to Ashland Town Forest, and then west into Sherborn, where the trail is almost all off-road. After crossing Noon Hill Reservation in Medfield, the Bay Circuit continues into Walpole. Highlights from its northwestern and southern sections include the Ward Reservation in Andover; Borderland State Park in Easton; and Tubbs Meadow, a former cranberry bog in Pembroke. As the chairman of the Bay Circuit Alliance, French is the trail's chief cheerleader and lobbyist. The project, he says, "has been one of the most important things in my life." Jan Fowler, a Bay Circuit volunteer, struggled to characterize what French has contributed to the trail. "His soul," she offered, finally. French can be pressured into admitting he graduated from Yale (class of '54) and then Harvard Business School, but seems embarrassed, as if the Ivy League is a blemish on the résumé of an outdoorsman. After school, he went into the printing business. Then, in 1966, during an overnight trip to Mount Monadnock in New Hampshire, French and a friend stared into a campfire and talked themselves out of the rat race. They quit their corporate jobs and started an outdoor equipment company. "I discovered that for me it's best to have a life close to the outdoors and a life that is small, with small organizations," he says. French now runs Moor & Mountain, a backpacking gear store in Andover. The headquarters of the Bay Circuit Alliance is at his store, in a cluttered corner of piled paper and file folders that looks like it was organized by pack rats. One of his heroes is Benton MacKaye, father of the Appalachian Trail, which runs 2,175 miles from Georgia to Maine. A forester and a planner, MacKaye proposed the Appalachian Trail in 1921, writing: "Life for two weeks on the mountain top would show up many things about life during the other fifty weeks down below." In the 1930s, MacKaye helped develop a proposal for the Bay Circuit, which had been proposed by a landscape architect, Charles Eliot. Very little happened on the project until the 1980s, when the state of Massachusetts contributed more than $3 million from an open space bond to provide planning grants and to protect Bay Farm, the southern terminus, according to the alliance. When the money ran out, the state turned the project over to grass-roots volunteers. Some short gaps along the Bay Circuit still remain, in places the alliance has been unable to get easements. Where there are gaps, the trail directs hikers onto streets, some of which are busy and not scenic. French promises to keep working to close the gaps, to move more of the trail off-road, and perhaps to encourage the development of camping areas along the route. After 20 years of work, he says, the Bay Circuit "is still not a household name, but we're going to make it so." The Bay Circuit Trail is envisioned as a second "emerald necklace" that rings Boston, extending 200 miles through 50 cities and towns from Kingston Bay in the south to Plum Island, Newburyport, in the north. It was first proposed in 1929, and in recent years organizers have sought to connect more than 85 acres of protected land in a greenway. The trail is stitched mainly from existing footpaths over land owned by state agencies, municipalities, land trusts, utilities, and conservation groups. Where forests no longer exist, it follows town streets, sticking wherever possible to historic neighborhoods.